Before reading this tutorial you should know a bit of Python. If you would like to refresh your memory, take a look at the Python tutorial. If you wish to work the examples in this tutorial, you must also have some software installed on your computer. Please see http://scipy.org/install.html for instructions. NumPy’s main object is the homogeneous multidimensional array. It is a table of elements (usually numbers), all of the same type, indexed by a tuple of positive integers. In NumPy dimensions are called axes. For example, the coordinates of a point in 3D space [1, 2, 1] has one axis. That axis has 3 elements in it, so we say it has a length of 3. In the example pictured below, the array has 2 axes. The first axis has a length of 2, the second axis has a length of 3.
the number of axes (dimensions) of the array. the dimensions of the array. This is a tuple of integers indicating the size of the array in each dimension. For a matrix with n rows and m columns, shape will be (n,m). The length of the shape tuple is therefore the number of axes, ndim. the total number of elements of the array. This is equal to the product of the elements of shape. an object describing the type of the elements in the array. One can create or specify dtype’s using standard Python types. Additionally NumPy provides types of its own. numpy.int32, numpy.int16, and numpy.float64 are some examples. the size in bytes of each element of the array. For example, an array of elements of type float64 has itemsize 8 (=64/8), while one of type complex32 has itemsize 4 (=32/8). It is equivalent to ndarray.dtype.itemsize. the buffer containing the actual elements of the array. Normally, we won’t need to use this attribute because we will access the elements in an array using indexing facilities. There are several ways to create arrays. For example, you can create an array from a regular Python list or tuple using the array function. The type of the resulting array is deduced from the type of the elements in the sequences. A frequent error consists in calling array with multiple numeric arguments, rather than providing a single list of numbers as an argument. array transforms sequences of sequences into two-dimensional arrays, sequences of sequences of sequences into three-dimensional arrays, and so on. Often, the elements of an array are originally unknown, but its size is known. Hence, NumPy offers several functions to create arrays with initial placeholder content. These minimize the necessity of growing arrays, an expensive operation. The function zeros creates an array full of zeros, the function ones creates an array full of ones, and the function empty creates an array whose initial content is random and depends on the state of the memory. By default, the dtype of the created array is float64. To create sequences of numbers, NumPy provides a function analogous to range that returns arrays instead of lists. the rest are also printed from top to bottom, with each slice separated from the next by an empty line. One-dimensional arrays are then printed as rows, bidimensionals as matrices and tridimensionals as lists of matrices. See below to get more details on reshape. To disable this behaviour and force NumPy to print the entire array, you can change the printing options using set_printoptions. Arithmetic operators on arrays apply elementwise. A new array is created and filled with the result. Some operations, such as += and *=, act in place to modify an existing array rather than create a new one. When operating with arrays of different types, the type of the resulting array corresponds to the more general or precise one (a behavior known as upcasting). Many unary operations, such as computing the sum of all the elements in the array, are implemented as methods of the ndarray class. NumPy provides familiar mathematical functions such as sin, cos, and exp. In NumPy, these are called “universal functions”(ufunc). Within NumPy, these functions operate elementwise on an array, producing an array as output. One-dimensional arrays can be indexed, sliced and iterated over, much like lists and other Python sequences. The expression within brackets in b[i] is treated as an i followed by as many instances of : as needed to represent the remaining axes. NumPy also allows you to write this using dots as b[i,...]. The order of the elements in the array resulting from ravel() is normally “C-style”, that is, the rightmost index “changes the fastest”, so the element after a[0,0] is a[0,1]. If the array is reshaped to some other shape, again the array is treated as “C-style”. NumPy normally creates arrays stored in this order, so ravel() will usually not need to copy its argument, but if the array was made by taking slices of another array or created with unusual options, it may need to be copied. The functions ravel() and reshape() can also be instructed, using an optional argument, to use FORTRAN-style arrays, in which the leftmost index changes the fastest. On the other hand, the function row_stack is equivalent to vstack for any input arrays. In general, for arrays of with more than two dimensions, hstack stacks along their second axes, vstack stacks along their first axes, and concatenate allows for an optional arguments giving the number of the axis along which the concatenation should happen. When used with arrays as arguments, r_ and c_ are similar to vstack and hstack in their default behavior, but allow for an optional argument giving the number of the axis along which to concatenate. vsplit splits along the vertical axis, and array_split allows one to specify along which axis to split. Simple assignments make no copy of array objects or of their data. Python passes mutable objects as references, so function calls make no copy. Different array objects can share the same data. The view method creates a new array object that looks at the same data. >>> s = a[ : , 1:3]     # spaces added for clarity; could also be written "s = a[:,1:3]"
The copy method makes a complete copy of the array and its data. Here is a list of some useful NumPy functions and methods names ordered in categories. See Routines for the full list. Broadcasting allows universal functions to deal in a meaningful way with inputs that do not have exactly the same shape. The first rule of broadcasting is that if all input arrays do not have the same number of dimensions, a “1” will be repeatedly prepended to the shapes of the smaller arrays until all the arrays have the same number of dimensions. The second rule of broadcasting ensures that arrays with a size of 1 along a particular dimension act as if they had the size of the array with the largest shape along that dimension. The value of the array element is assumed to be the same along that dimension for the “broadcast” array. After application of the broadcasting rules, the sizes of all arrays must match. More details can be found in Broadcasting. NumPy offers more indexing facilities than regular Python sequences. In addition to indexing by integers and slices, as we saw before, arrays can be indexed by arrays of integers and arrays of booleans. When the indexed array a is multidimensional, a single array of indices refers to the first dimension of a. The following example shows this behavior by converting an image of labels into a color image using a palette. We can also give indexes for more than one dimension. The arrays of indices for each dimension must have the same shape. Naturally, we can put i and j in a sequence (say a list) and then do the indexing with the list. However, we can not do this by putting i and j into an array, because this array will be interpreted as indexing the first dimension of a. Even though 0 occurs twice in the list of indices, the 0th element is only incremented once. This is because Python requires “a+=1” to be equivalent to “a = a + 1”. When we index arrays with arrays of (integer) indices we are providing the list of indices to pick. With boolean indices the approach is different; we explicitly choose which items in the array we want and which ones we don’t. 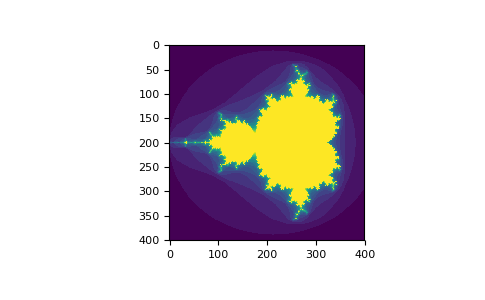 ...     """Returns an image of the Mandelbrot fractal of size (h,w).""" Note that the length of the 1D boolean array must coincide with the length of the dimension (or axis) you want to slice. In the previous example, b1 has length 3 (the number of rows in a), and b2 (of length 4) is suitable to index the 2nd axis (columns) of a. The advantage of this version of reduce compared to the normal ufunc.reduce is that it makes use of the Broadcasting Rules in order to avoid creating an argument array the size of the output times the number of vectors. Work in progress. Basic linear algebra to be included here. See linalg.py in numpy folder for more. >>> u = np.eye(2) # unit 2x2 matrix; "eye" represents "I"
The eigenvalues, each repeated according to its multiplicity. Here we give a list of short and useful tips. >>> a.shape = 2,-1,3  # -1 means "whatever is needed"
The logic behind those functions in more than two dimensions can be strange. 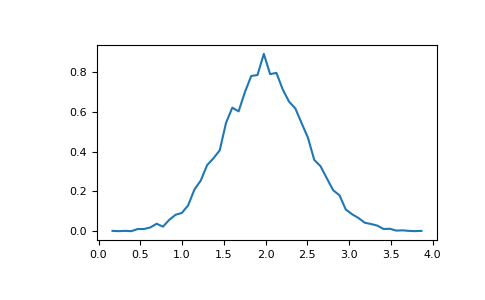 The NumPy histogram function applied to an array returns a pair of vectors: the histogram of the array and the vector of bins. 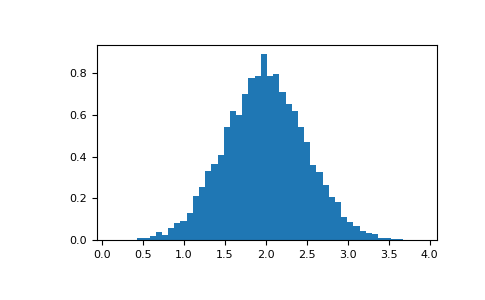 Beware: matplotlib also has a function to build histograms (called hist, as in Matlab) that differs from the one in NumPy. The main difference is that pylab.hist plots the histogram automatically, while numpy.histogram only generates the data.